Our guest blogger this month is Debbie Bates, President of Bates Creative. Marketing leaders can no longer ignore the necessity of including mobile app marketing strategies in their marketing mix. Our customers and community members browse and buy very differently than in the past. We live in an omni-channel world, and it has transformed how our businesses connect with their audiences. The numbers prove that our customers are increasingly reliant on mobile apps. eMarketer did a digital deep dive, and learned that nearly 86% of a buyer’s smartphone time is spent in apps. In this post, I’d like to walk you through the stages of the mobile app ideation and design journey, and share how you can capitalize on these customer shifts. The evolution of the customer journey and rapid speed of business has made it difficult for marketers to keep their communications materials and assets up to date. ExxonMobil embarked on launching a corporate mobile app to solve this challenge. This dynamic app offers a rich library of public-facing corporate resources for people to download and explore. 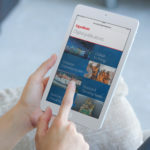 ExxonMobil previously published these resources as static PDFs and wanted to evolve these into interactive, digital publications housed in one mobile app. When identifying potential mobile applications for your audience, consider how these three capabilities could bolster your brand and customer experience. Tourism and travel industries must now think of ways to provide customers and visitors with glimpse into their world—often well before they arrive at their destination. As you plan live events or customer onsite visits to your offices, you may want to incorporate some of their approaches into your app strategy. 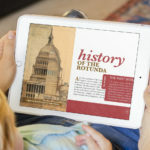 resources, visitors can explore and learn about the history of the U.S. Capitol Rotunda and its surroundings. 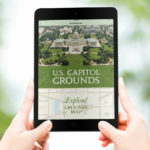 The interactive apps also supplement the experience for visitors when the U.S. Capitol is closed to events or during restoration periods. This provides the next-best experience to an onsite tour. 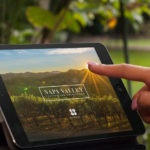 Similarly, Napa Valley Vintners (NVV), a nonprofit trade association, aimed to create a mobile app experience that highlighted the culinary excellence found in its world famous wine region. NVV wanted a medium to showcase this environmental leadership and devotion for the greater public and potential distributors. The Napa Valley Cultivating Excellence app is now used by wine professionals, educators and members of the trade as an educational and sales tool. Bringing these branded experiences to your audience’s fingertips creates a memorable mobile moment. It also gives you first mover advantage. It differentiates your brand from competitors who have not yet entered the app arena. What customer challenge/s will you help solve with your brand’s mobile app? How will you maintain a consistent omni-channel experience across all media channels? Plan out your app’s content strategy and interactive experiences that work in conjunction with your other digital products and offline marketing initiatives. What KPIs will you track to measure your app’s success? Typical metrics may include number of downloads, amount of time spent in the app, and the number of social shares. Be prepared to evolve your app as you are informed by user analytics. These business drivers, coupled with the rapid shift in customer behavior, create a compelling case for building mobile apps. They are guaranteed to create a smoother transition from discovery to download. Copyright 2017, Debbie Bates. All rights reserved. Bates Creative is a full-service design agency in the Washington, D.C. metro. They provide Artistic Intelligence—strategic insights and a keen eye for high impact design—that achieve our clients’ goals and then some. Follow @dschrott and @batescreates on Twitter.